The KDE aKademy will take place in Ludwigsburg. Ludwigsburg is located in the south of Germany, very close to Stuttgart (10 km to the north). Facilities are hosted and sponsored by the Filmakademie Ludwigsburg Mathildenstraße 20, 71638 Ludwigsburg. The Filmakademie is the "Academy of Movies", an award-winning school in their field of art. Ludwigsburg can be reached fairly easily by public transport (Stuttgart Airport is close, and Frankfurt Airport is less than 2 hours on the train). Please check in at the aKademy before 10pm on the days of the Contributor and Developer Conference and of the User and Administrator Conference, and before 7pm on Coding Marathon days. If you arrive after that time, please notify the aKademy staff at +49 7141 969 133. There is only one camping place anywhere in reach of public transportation. It is in Stuttgart-Bad Cannstatt, Mercedesstraße 40, about 40 minutes by S-Bahn (S4 and S5 to Stuttgart main station, change to S1, S2 and S3 to Bad Cannstatt). Note that there is no public transportation available after midnight. Closer information on the camping place can be found on its website. By a 10 minute drive with the public bus you'll find Ludwigsburg Youth Hostel Gemsenbergstraße 21, 71640 Ludwigsburg (120 beds, 20 Euro breakfast and meal inclusive). There will be a shuttle service from the conference venue to the Youth hostel for the period when public transport is not available. The Youth Hostel is located 10 minutes by bus (lines 421 and 422 from the train station) near the bus stops Neckarbrücke (421) and Schlösslesfeld (422). 100 more places are available in the Stuttgart Youth Hostel Haußmannstr. 27, 70188 Stuttgart. This youth hostel is not booked out by KDE e.V., so that other participants can do reservations here as well. Please read the Youth Hostel Rules. Here is a description (and maybe map): klick me. You will get breakfast at the Youth hostel. The Filmakademie Cafeteria, Blauer Engel, serves meals for 5,50 Euro, until 6pm. There is going to be simple food like sandwiches and drinks available at Filmakademie, sold by volunteers at purchase price. Bakeries, fastfood, restaurants and cafes can be found all over downtown Ludwigsburg, close to the Filmakademie. Use A81/B27 Map24.de, leave the A81 at the exit Ludwigsburg-Süd, go on to the intersection Friedrichstraße/Stuttgarter Straße, there go left to B27 going to Stadtmitte (downtown). Before the bridge, prepare to turn right, then prepare to turn left. At the movie theatre Scala, go back to the direction of Stuttgart, turn right at the first intersection into Mathildenstraße. Note: There are hardly any free parking places around the Filmakademie. You may want to leave your car at the Youth Hostel and use the public transportation. Airport Stuttgart (STR) (closest): The best way to get to Ludwigsburg from the airport is by metro (called "S-Bahn" here). You can take both the S2 and S3 to downtown Stuttgart. At Stuttgart main station (Hauptbahnhof) you have to change to S4 or S5, both going to Ludwigsburg. (It may be more convenient to change already at "Schwabstrasse", which is 3 stops before Hauptbahnhof. From Ludwigsburg train station it is only a 10 minutes to walk to the Filmakademie, Mathildenstrasse 20. You will need about 50 minutes on the train. A one-way ticket costs 3.70 Euro. Please note that the last S-Bahn from the airport with connection to Ludwigsburg is going 11.38pm, the first one in the morning at 05:08am. Airport Frankfurt (FRA) use train to Ludwigsburg via Stuttgart (1,5 hours), or train to Stuttgart and go with metro (called "S-Bahn" here) to Ludwigsburg. S4 or S5, both going to Ludwigsburgi. You will need about 15 minutes on the train. A one-way ticket costs 2.70 Euro. 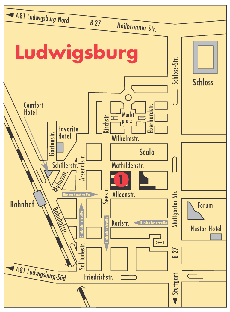 From the Ludwigsburg station you can walk to the Filmakademie, Mathildenstrasse 20, in 10 minutes (see below). Airport Munich (MUN), use train to Ludwigsburg via Stuttgart, or train to Stuttgart and go with metro (called "S-Bahn" here) from Stuttgart to Ludwigsburg. Use lines S4 or S5, both going to Ludwigsburg. You will need about 15 min, a one-way ticket costs 2.70 Euro. 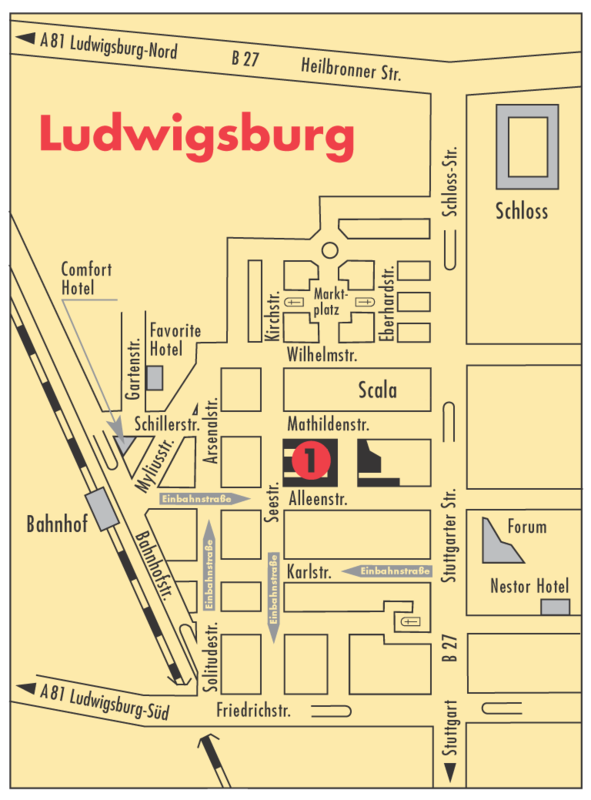 From the Ludwigsburg station you can walk to the Filmakademie, Mathildenstrasse 20, in 10 minutes (see below). From Stuttgart Main Station you can take metro (called "S-Bahn" here), both the S4 and S5 lines, to Ludwigsburg, and from there walk to the Filmakademie, Mathildenstrasse 20, in 10 minutes. You will need about 15 min, a one-way ticket costs 2.70 Euro. The last S-Bahn from Stuttgart main station is going at 0.28am, the first one at 4.56am.